It is possible to harness the energy from the sun and convert it into either electricity or heat using PV (photo-voltaic) or ST (solar thermal) technologies respectively. 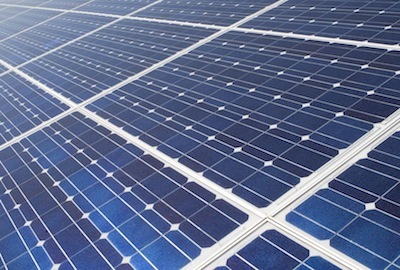 PV converts sunlight into electricity using a semiconductor material (normally silicon). When light strikes the cell a portion is absorbed within the semiconductor material knocking electrons loose and allowing them to flow. This results in an electric current and thus electricity production. PV panels primarily absorb the visible portion of the light spectrum. The PV panels may also directly run devices with DC power such as solar powered calculators, or lights. The DC electricity can also be stored in batteries. Standard PV panels are able to convert available sunlight into electricity with optimal conversion efficiency of around 15%, with some panels able to reach as high as 20%. It is important to note that a panel rated at 200Watts will not consistently provide 200Watts of electricity throughout the day. The 200Watt rating is based on maximum summer sun radiation level of 1000W/m2 ( 317.1Btu/ft2) in an ambient temperature of 25oC / 77oF. So on a clear summer day a 200Watt panel can be expected to provide around 0.7 - 0.8kWh of electrical energy. Solar thermal panels are referred to by a number of different names such as Solar Water Heater, Solar Hot Water Panel, Solar Hot Water Collector, Solar Thermal Panel or Solar Thermal Collector. These terms all describe the same generic device. Solar water heaters work by absorbing sunlight and converting it into usable heat. A simply analogy is to think about a dark coloured object sitting in the summer sun. Over time it can become very hot from absorbing the sunlight. Solar water heaters work in the same way by using materials that are specially designed to maximise the efficiency of that absorption. High quality absorber coatings, as used by Apricus products, are able to absorb up to 95% of the energy in sunlight throughout the full spectral range (PV only absorbs a portion of the spectrum). Below is an example of a quality absorber from coating manufacturer Tinox that absorbs 95% of available sunlight, and only radiates (emits) about 4% of the absorbed energy as heat. The key areas to look at are the yellow which represents solar radiation and the light blue which is how much of that sunlight is absorbed by the coating. 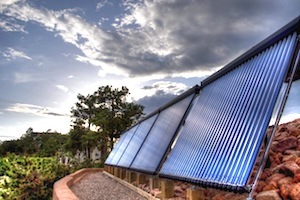 Solar water heaters, such as the AP evacuated tube solar collectors by Apricus that use evacuated tube technology, are able to reach a complete solar collector efficiency (not just the absorber) of nearly 70% based on aperture dimensions, and over 80% if you just consider the surface area of the black absorber. Solar water heaters can therefore reach efficiencies that are consistently more than 4 times higher than PV panels for a given aperture area. Solar Thermal and PV should not be seen as competing technologies or products as they perform different functions and as shown below can be installed together to provide a well balanced solar energy harnessing system. Electricity can be used for almost any application, and so is a universal energy source. Heat is required for hot water and space heating which represent a large percentage of a household's total energy requirements. A system that incorporates a solar thermal system with a modest sized PV system is a great option.